Campfield is an experienced healthcare business consultant with deep expertise in Federal Government and Commercial Business. 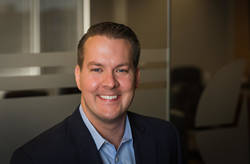 MedSys Group today announced the designation of Grant Campfield as Client Relationship Executive. In his role, Campfield will be responsible for companywide Federal and State Government business development, service delivery partnerships and Cerner client management. With a 6-year career at Cerner focused heavily on Federal Government contracting, he will help drive the company with the kind of knowledge and expertise it is known for. "Grant’s experience in Federal Government contracting and service delivery as well as his overall leadership skills are exactly what we need to drive our business going forward,” Mark Embry, MedSys Group Executive Vice President & Co-Founder said. “I am excited to join an experienced firm and look forward to establishing MedSys Group as a major contributor in the DoD and VA arena,” said Campfield.